Bi-State Construction has installed the temporary roadway that gives access to the bridge construction project and the pipes that will allow canal water to flow past the site as soon as the Centre Bridge pump is put back in service ( we hope this week). The towpath trail is CLOSED between Lower Limeport Bridge to the north and the bridge at Canal Park to the south. The project could take as long as April 2019, and the trail will be closed throughout that time. Please do not try to get through that area by removing barriers. They will be replaced and the project will take that much longer to complete. Also please be aware that the temporary roadway is for use only by the contractor and the owners of the riverside properties that have no other access. Your cooperation will be very much appreciated by all involved and affected. 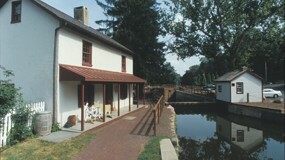 When the Commonwealth of Pennsylvania dug the 58.9-mile-long Delaware Canal between 1827 and 1831, it was responsible for connecting the private properties that the new ditch divided. Thus, more than 100 bridges were built, most of which were camelback bridges. A camelback bridge is a modified Queen Post Truss bridge, perfectly adapted for canal use since it has a hump in the middle, which allowed canal boats to more easily pass underneath. Today the successors to the original camelback bridges are the Delaware Canal’s signature structures exemplifying the waterway’s history. Over the years, changes in vehicle types and traffic requirements have caused most of the bridge to be replaced with larger, hefty versions, but six authentic camelbacks still remain. For over a decade, the Friends have been on a quest to ensure that these last six genuine pieces of history are restored. Not only are they vital factors to the Canal’s National Historic Landmark status, but their delicate design guides new construction. The Friends are directly responsible for the successful restoration of three of the camelbacks and were instrumental in the preservation of the fourth. 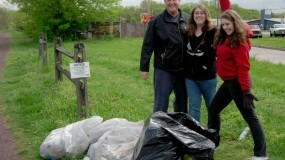 Our volunteers perform continuing maintenance, such as painting and vegetation removal. Two camelbacks are still in need of work – Woody’s Bridge south of Easton and Spahr’s Bridge in Bridgeton Township. This fall, the stars aligned in favor of Woody’s. It needed significant repairs so that it could continue to carry pedestrians, but was not so deteriorated that it needed a complete rebuild. Contractor Randy Myer is determined to get the restoration of Woody’s Camelback Bridge done this winter. So far, the Friends have raised $20,000 for this project thanks to generous contributors who want the Canal’s history preserved. Now we need your help to raise the balance of the needed funds. 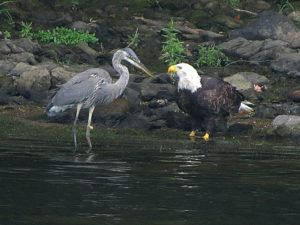 You may contribute on-line at www.fodc.org or send a check to Friends of the Delaware Canal, 145 South Main Street, New Hope, PA. 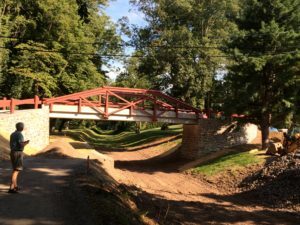 Please help restore Woody’s Bridge, the best example of how camelback bridges once were – delicate, graceful, utilitarian, and very beautiful. The Friends’ Canal Action Team (CAT) has been tackling a wide variety of projects since it was formed in the winter of 2014. Everything from removing vegetation from stone walls to bridge painting to replacing interpretive signs to pulling out cattails is fair game. As 2017 begins, we would like to reinvigorate our list of volunteers who are interested in working on the CAT. WHO: Anyone who wants to and can be physically active. Especially needed are people who like to paint bridges and those who would like to lead a crew. When: CAT projects can be undertaken both on weekdays and weekends. Usually they take no longer than 3-4 hours. Where: Work sites are determined by the urgency of the job and the location and number of available volunteers. The Plan: If you want to be part of CAT, please call 215-862-2021 or e-mail friends@fodc.org and give us your contact info and your preferred work locations (north, central, south). When a work day is developed, an e-mail notice containing the job details is sent to all the prospective volunteers about two weeks prior. Those who can help on a particular project just respond to the e-mail and show up on the appointed day. Be part of CAT! 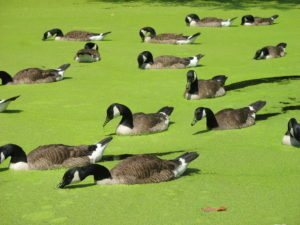 Get things done along the Canal and enjoy working with your fellow Friends. My first seven months at the Canal have been exciting and full of challenges and successes. We wrapped up 2016 with several wall repair projects. During the maintenance drawdown in October we hired several contractors to make repairs to multiple walls that failed and collapsed along the Canal. Wall repairs have been completed at Lock 5 in Yardley, along Mile Post 21 in the Bowman’s Hill area, adjacent to Lock 22/23 in the Teddy Roosevelt Recreation Area, and at Woody’s Bridge in the Raubsville area. Also during the drawdown, Park and engineering staff were able to inspect several areas of the Canal and develop plans for future projects and maintenance work. Park maintenance crews were also busy repointing walls and waste gates, dredging, fixing additional sink holes ,and working on many other preventative maintenance projects. To close out 2016, the river/weather finally cooperated with us by providing enough rain and higher river levels to start re-watering the southern end of the canal during the middle of December. 2017 will bring its challenges and successes as well. We will be starting the New Year with several projects already in progress. First, in partnership with the Friends, an experienced contractor has been hired to make repairs to Woody’s Bridge in the Raubsville area. We have had another wall collapse in the Kintnersville area by Lehnenberg Road. A contractor has already been mobilized, and repairs to this wall have begun. Finally, the Park has discovered two new sinkholes in the northern section of the Park – one in Smithtown between Bridges 2 and 3 and the second in Williams Township just north of the Easton sewage treatment plant. Repairs to these sinkholes will be forthcoming once the weather decides to cooperate with us. 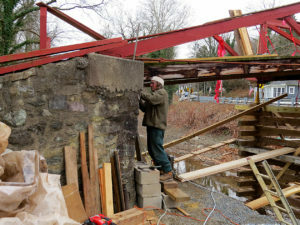 Also, work on the Lower Limeport Bridge in Solebury Township has begun and is expected to continue through April. We have another bridge project on the horizon as well. The final design work and permitting is being done for the Phillips’ Mill Bridge. We are expecting this project to go out to bid late this winter and to be ready for construction later this spring. Enjoy the Canal! Our members just kept coming through the doors of the David Library of the American Revolution on November 15. The Rose Gallery, where the covered dish dinner was held, was filled with people and great food; and everyone was thankful for the spacious seating and high quality audio visual equipment upstairs in Stone Hall where our presentations were held. We are so appreciative of the Library’s willingness to share their facilities with the Friends. The after-dinner presentation included some Friends’ Board of Directors business. Retiring Board member Stephanie Garomon was thanked for all her efforts on behalf of our organization, especially in terms of organizing fundraising events. Pam Can, Judy Franlin, Joan Fullerton, Lynn Vogel, and David Scheaffer were all elected to additional Board terms. The Annual Meeting is always a great time to get together with old and new friends, take stock of the year’s activities, and gear up for the coming year. And that’s just what we did. As always, the Board welcomes your participation and input. 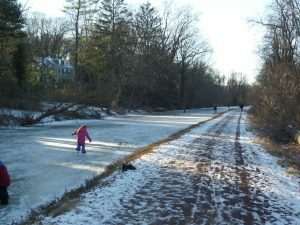 Movies taken of the Delaware Canal during the first half of the 20th century and interviews with men and women who worked on the Canal are now available for you to see and hear on your computer, iPad, or phone. 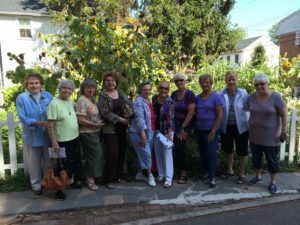 These treasures are easily accessible thanks to the efforts of the Solebury Township Historical Society and the cooperation of the National Canal Museum in Easton. Two members of the Society, who are also dedicated members of the Friends of the Delaware Canal, collaborated with the National Canal Museum to preserve the Museum’s cassette and film collection. Robert McEwan, Society Vice President and archivist, and Elizabeth Carrick, the Society’s web consultant have devoted a tremendous number of hours to evaluating the collection and publishing the best of it on the Solebury Township Historical Society website www.soleburyhistory.org. To share these valuable pieces of history with more canallers, the Society has very generously invited the Friends to place a link to the material on our website www.fodc.org. The movies and the interviews can be found here. So, if you’ve wondered what the Delaware Canal was like when mule teams pulled coal-laden boats to market, you can now find out by just clicking. 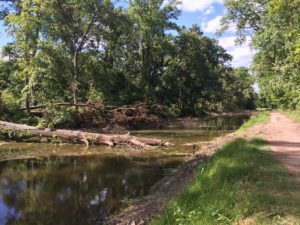 The Solebury Township Historical Society’s new collection of videos and oral histories contains images of Canal sites that have disappeared. 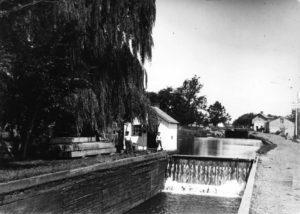 This is a John Anderson photograph of Lock 10 in New Hope, now covered by Main Street. Detour around the Lower Limeport Bridge construction project. **TRAIL CLOSURE** A portion of the towpath will be closed due to construction surrounding a bridge replacement project at Lower Limeport Bridge. The closed portion is in Solebury Township between Upper Limeport Bridge and Phillips Mill Bridge, approximately 0.25 miles north of Phillips Mill. Please heed the barricades and avoid this area, or find alternate routes. Do not trespass on private property to bypass this area. 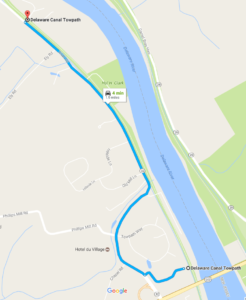 For bicyclists, this section can easily be bypassed by following River Road (Route 32) for a short distance by exiting and/or entering the towpath at Upper Limeport Bridge and Canal Park in Solebury Township. Please DO NOT enter the construction zone AT ANY TIME, regardless of whether it is active or not, for your safety and that of the workers and equipment. Park officials expect the tow path to re-open by the end of April 2017. If you have any questions or need additional information about the trail closure please feel free to contact the park office.